Burberry’s Spring/Summer 2019 Show was held in London on the 17th of September. Since being appointed CCO at Burberry earlier this year, it was Riccardo Tisci’s debut collection. Like their S/S 2014 show, Burberry collaborated with Apple shooting photography for their social media on the just-released iPhone XS. The collection was very sophisticated capturing that classic, elegant Burberry heritage style with a modern twist. The colours were very neutral throughout paired with gold detailing and accessories. 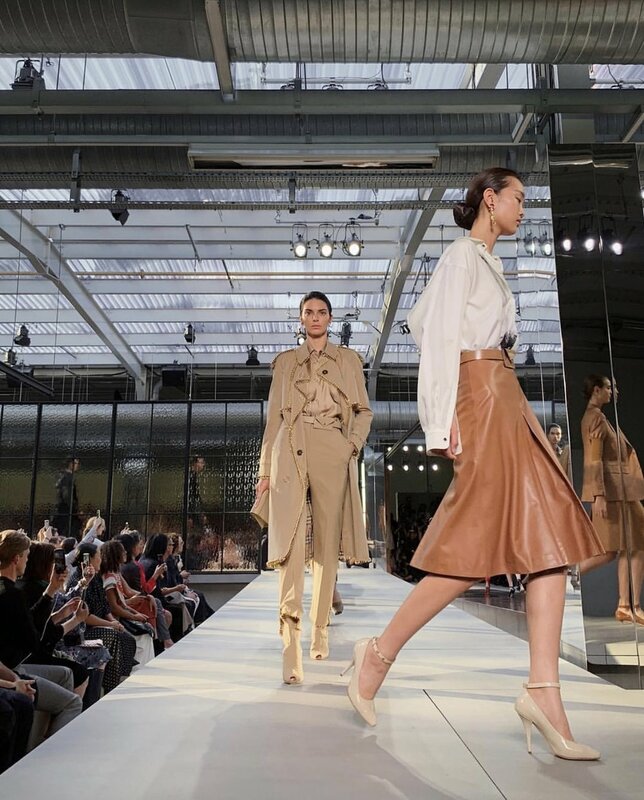 Key pieces that were featured included variations of their iconic trench coat, headscarves (tied in the hair & on the waist), leather clutches, and knee-length skirts and dresses. Thomas Burberry’s initials were monogrammed into accessories such as the belt featured in the image below. For the men’s collection, there was a mixture of traditional and sporty styles. White shirts, long-length formal coats and blazers were initially shown on the runway, followed by looser-fitted trousers & shirts, trainers, shorts and t-shirts, in the same neutral colour scheme. The first pieces from the collection are exclusively available to purchase directly from Instagram for 24 hours only.